After 200 miles of twisting hairpin turns yesterday, Bret’s rear tire was beat. The steel belt started to show through the layers of rubber. After a morning on the phone we found a motorcycle shop with the right tires in stock that could change the tire today. We just had to gingerly ride the five hours there. Leaving Graberville the sun was shining a perfect 72 degrees. We passed yet another Big Foot themed roadside store and rode to the start of the Pacific Coast Highway 1, which is one of the most beautiful roads in America. It follows the rugged shoreline of the California coast almost the whole way north to south. The road is serrated with curves and cliffs dropping hundreds of feet into the ocean for mile after mile. It’s very fun but challenging to traverse on motorcycle, especially when trying to make good time. Short story: Brendan crashed on a cliff and didn’t die. Long story: approaching a cliff the road drops 90 degrees to the left and down into the sweeping right turn back up the hill around an inlet. The ocean is about 150 feet below the road at the cliff’s edge. The turn could safely be made at 10-15 MPH. I (Brendan) entered at the right speed, but began leaning too late after taking in the view. Simply learning more aggressively can pull you through most turns, but at low speeds the bike falls faster than it turns so I low-sided (the bike loses traction in a turn and slides from underneath the rider). Thankfully the speed was so low (about 13-14 mph) that I hit the road without sliding or rolling at all. I didn’t feel a thing thanks to my gear. My boots, pants, gloves, and jacket all have scuffs or broken stitches but my body survived 100%. My Kawasaki Concours 1400 wasn’t so lucky. It weighs 4.3x more than me, so it slid into the guard rail (some parts of this road have no rail) which saved it falling into the ocean. It lightly bounced off and slid about 15 feet down the road. There weren’t any oncoming or following vehicles, and we got the bike back up pretty quick. The left mirror sheered off, the fairing cracked and broke on both sides, and the gearshift lever snapped off. The only way out was another 50 miles to Mammoth Motorsports with Bret easing along on a deteriorating tire, Brendan trying to stay in third gear and shifting with his heel when necessary, and Steve still riding with a side case lashed on with straps. We made it just before closing and the store stayed open late to help get us back on the road. New tires, fresh oil, a fabricated shift lever, and a replacement case mounting bolt, and we were on our way. Thank you Mammoth! The shop owner recommended a Vietnamese restaurant nearby and we hit the road after a quick bite. 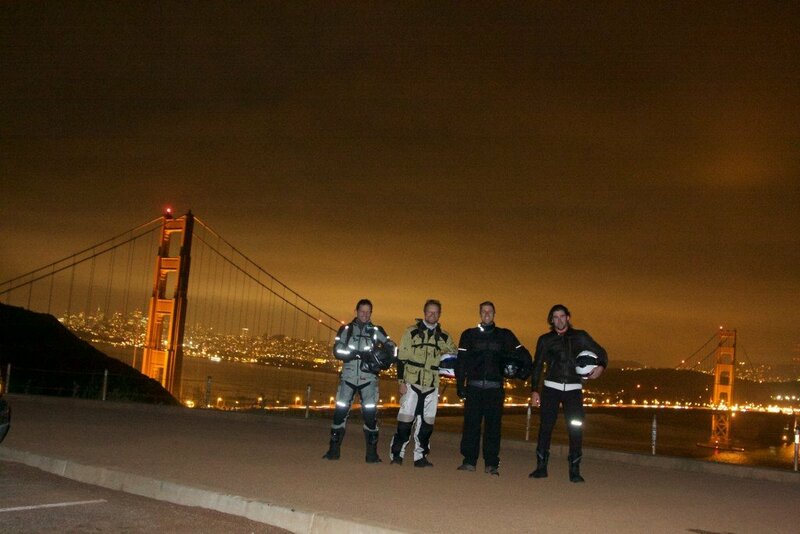 It was already dark but we made great time on the last two hours to San Francisco and quick photo stop at the Golden Gate Bridge. We made it south to Campbell shortly after and bedded down at the hotel.